The character "Godzilla" owned and created by Toho Co., Ltd.
Godzilla (ＧＯＤＺＩＬＬＡ ゴジラ, Godzilla Gojira?) is a 2014 American science fiction monster film produced by Legendary Pictures, making it the second American-made Godzilla film after Godzilla in 1998. It is the 30th entry in the Godzilla franchise, as well as the first film in the MonsterVerse. The film was released to American theaters on May 16, 2014, and to Japanese theaters on July 25, 2014. Godzilla was directed by Gareth Edwards, with a screenplay by Max Borenstein. It acts as a reboot to the franchise, with the film detailing a world where Godzilla rises in the present day to fight its native predator, following their own awakening. Godzilla, as a reboot, would be the launchpad for a new continuity and cinematic universe known as the "MonsterVerse". It will be followed by multiple sequels, the first being 2019's Godzilla: King of the Monsters, which is slated for release on May 31, 2019, while the second, Godzilla vs. Kong is set to release on March 13, 2020. A spin-off/prequel, Kong: Skull Island, was released in 2017, acting as an origin story for the universe's incarnation of King Kong. Godzilla was awakened in 1954 by a Russian military submarine accident. Throughout the mid-1950s, the United States and Russian militaries attempted to kill Godzilla through the use of nuclear weapons; however, Godzilla survived every attempt, and the operation was covered up under the guise of atomic tests, keeping his existence hidden from the general public. Film footage shows the preparation and detonation of a nuclear bomb at Bikini Atoll. Years later, in 1999, Doctor Ishiro Serizawa is called to a mining site in the Philippines along with his assistant, Doctor Vivienne Graham. Accompanied by a small team, he finds a colossal fossilized skeleton and two spores in a large underground cave - one of which has already hatched. Upon noticing the spore breach, the team then comes across a nearby tunnel extending up to the surface; at the tunnel's exit, they find a massive trail leading out to the ocean. The other spore, still unhatched, is taken to Mount Yucca in Nevada, United States, where it is stored in a nuclear waste repository. Days later, near Tokyo, Japan, a nuclear power plant located in the city of Janjira starts to experience seismic activity. Nuclear physicist and plant supervisor Joseph Brody and his wife, Sandra Brody, make their way to the power plant. Sandra assembles a team to perform a damage check, under Joe's supervision. The power plant is soon breached by an explosion and radiation leak, killing Sandra and her team, leaving Joe and their son, Ford, alone, and bringing the entire area down to ruins. The event is attributed to a large earthquake, and the Janjira area is evacuated and subsequently quarantined. On the Saratoga, Serizawa and Graham are revealed to be part of a secret organization called Monarch. Serizawa reveals that they knew of the creatures beforehand, and explains to Ford what the monster that attacked the plant, now referred to as a M.U.T.O. (Massive Unidentified Terrestrial Organism), is, detailing its ancient origins and that it feeds on radiation and radioactive materials, moving underground and putting itself in a cryptobiotic state when Earth's radiation subsided. Serizawa also explains Godzilla's origins, the numerous failed attempts to kill him with nuclear weaponry and the subsequent cover-up stories. Ford informs Serizawa of what his father knows, explaining that Joe mentioned tracking a form of echolocation within Janjira, leading the team to think that the M.U.T.O. was communicating with something. Ford is then taken to Honolulu, Hawaii to eventually return to San Francisco. In the midst of a dense forest in Honolulu, a U.S. Navy Special Forces team finds the wrecked remains of a Russian nuclear submarine that, earlier, reported an attack. While there, the winged M.U.T.O. arrives on the island, ripping apart the submarine and feeding on its reactor. After being threatened by the military it sends out an electromagnetic pulse which shuts down all electronics within miles. Meanwhile, Ford is boarding a train, where he witnesses a young boy named Akio being separated from his parents. Ford, holding Akio, assures his parents that he will return their son. After the EMP caused by the M.U.T.O., the train comes to a standstill for a moment before the power returns. Ford and Akio are almost killed by the M.U.T.O., which bites into the tracks and causes the train to derail and hang. On a different side of the city, Godzilla's arrival creates a tsunami which destroys most of Waikiki. The M.U.T.O. 's actions start a chain reaction that leads to mass destruction at Honolulu International Airport, where Godzilla arrives. After a brief fight, the M.U.T.O. flies off with Godzilla pursuing it, and the two monsters are no longer a secret as footage of the brawl airs on the news, which Elle and Sam witness. Serizawa reports that Godzilla appeared because he heard an echolocation signal and is hunting the M.U.T.O.. They later question why the M.U.T.O. would send out a signal, and soon realize that the other spore is still active and later find out that it has hatched. The resulting hatchling, much larger in size than the first, is then found to have broken out of the repository and started attacking Las Vegas, Nevada. The team concludes that the larger M.U.T.O. is female whereas the winged one is a male and that they plan on nesting in San Francisco. Stenz approves an idea that involves attracting the monsters to a nuclear warhead and detonating it in the ocean, hoping to destroy all three monsters. Serizawa disapproves, claiming that Godzilla could be the only thing that could stop the M.U.T.O.s. Ford, now on the mainland, journeys on a military train with a group of soldiers to get Elle and Sam out of San Francisco. The train, containing two ICBMs which were hoped to be strong enough to kill the three monsters, is destroyed by the female eight-legged M.U.T.O., who was resting on a nearby cliffside, and Ford is found the next morning, left as the only survivor. One of the warheads is consumed by the creature, while the other warhead is flown by helicopter to San Francisco. The male M.U.T.O. arrives shortly after and steals the warhead immediately after it is armed to detonate. At this time, citizens in San Francisco are being evacuated on school buses. Elle leaves Sam with a trusted friend while she stays behind to help around in the hospital. The buses then make their way out of the city through the Golden Gate Bridge, where it is blocked off and is surrounded by the military. Godzilla resurfaces near the bridge, where the NAVY opens fire in an attempt to prevent him from entering the city, despite the protests of the soldiers on the bridge due to the presence of civilians. The commotion caused by both the military and Godzilla results in the destruction of the bridge, killing and injuring many people and only leaving two buses intact. Realizing that Godzilla may be the only thing capable of stopping the M.U.T.O.s, the military allow him to proceed into the city. The M.U.T.O.s meet in downtown San Francisco and start building their nest after a short mating ritual. The male M.U.T.O. is attacked by Godzilla and another conflict ensues. Ford is ordered to go on a HALO drop with a team in order to retrieve the warhead from the M.U.T.O. nest and turn it off so it does not detonate in the city's center. After parachuting into the city, they quickly locate the nest. The female M.U.T.O. goes to assist the male against Godzilla, giving the team the perfect time to locate the warhead. After finding it and getting out of the nest, Ford stays and, using a damaged fuel truck, destroys the nest of eggs in a fiery explosion before the baby M.U.T.O.s could hatch. This attracts the female M.U.T.O. 's attention, and inadvertently saves Godzilla, who was being overwhelmed by the M.U.T.O.s. The M.U.T.O.s leave Godzilla and rush to their nest. The female M.U.T.O. spots Ford, but before she can kill him, he is saved by Godzilla, who knocks the female M.U.T.O. back with two blasts of his atomic breath, giving Ford the chance to escape. Before Godzilla can finish her off, the male M.U.T.O tries to attack him again, but Godzilla manages to kill the male by using his tail to slam it into the 44 Montgomery building using his tail. The building then collapses, pinning Godzilla underneath a pile of rubble and dust. Falling to the street, Godzilla sees Ford as he runs to the docks. The two briefly stare at each other before Godzilla disappears in a cloud of smoke. The team gets to the bay and realizes they cannot disarm the warhead, and devise a plan to sail it out into the ocean, far enough to not endanger the population. While loading it onto a boat, the female M.U.T.O. recovers from her injuries, attacks the crew and kills all except Ford. Ford starts to drive the boat, but he is confronted by the female. Wounded and exhausted, he attempts to hold her back with his sidearm. However, Godzilla returns and grabs the M.U.T.O. by her neck. After a brief struggle, Godzilla directs a charged atomic ray into her throat, which causes her neck to explode, ultimately decapitating and killing her. Exhausted, Godzilla throws her head in the water and collapses on the city's shoreline. Ford drives the boat out to sea and is rescued by helicopter before the warhead detonates. The next day, during the aftermath of the chaos, he is reunited with Sam and Elle. Godzilla is presumed dead until he wakes up in the morning. The media acknowledges Godzilla's actions, hailing him as "King of the Monsters" and debating on his role as the city's possible "savior." Godzilla lets out a final roar before returning to the ocean to lay dormant once again. Film producer Brian Rogers met former Toho company director Yoshimitsu Banno, who had the rights to make an IMAX 3D Godzilla film. Rogers then met Toho to arrange a license to produce a 3D Godzilla film. After securing the rights, Rogers approached several film companies and Legendary Pictures agreed to work with Rogers on the project. In August, rumors surfaced that Legendary were in talks with Toho to produce a new American Godzilla film to be released in 2012. On March 29, it was confirmed that Legendary had acquired the rights to Godzilla. They plan to reboot the franchise with Warner Bros. co-producing and co-financing. TriStar Pictures would not be involved in the production because their rights to the character expired in 2003. Legendary plans to make the new film closer in style to the original Japanese character than TriStar's iguana-like creature. According to Thomas Tull, chairman and CEO of Legendary Pictures, "Our plans are to produce the Godzilla that we, as fans, would want to see. We intend to do justice to those essential elements that have allowed this character to remain as pop culturally relevant for as long as it has". The film was first announced at Comic-Con 2010 where an early concept art impression for the new Godzilla was revealed. Gareth Edwards, director of the movie Monsters was announced as the director. Mr. Edwards stated he knows the importance of getting the film right for the fans. In October, David Callaham was named to write the first draft of the script. After Callaham, four more people worked on the screenplay during the film's development. David Goyer (the story writer for The Dark Knight trilogy) was announced as a writer for the film. Many fans were excited about the this choice as they say David Goyer, along with Christopher Nolan, brought justice to the Batman movies using dark themes. However, Goyer only worked for a few weeks on the script and did not get screenwriting credit. At the 3D Summit conference held in September 2010 at Universal Studios, producer Brian Rogers confirmed the planned start date of 2012. The reboot will be a live-action project featuring a computer-generated Godzilla. Godzilla will fight at least one other monster, rather than the United States Army like in Roland Emmerich's film. It was also mentioned that Godzilla will use his atomic breath, a trademark weapon omitted by Emmerich and co-writer/producer Dean Devlin in the previous American film in favor of power breath. In November 2011, Max Borenstein was hired to continue work on the script. During Comic-Con 2012 in July, director Gareth Edwards participated in a Godzilla panel, in which they screened a new teaser trailer, described as so, a destroyed city is seen, as Robert Oppenheimer's speech comes in, "I am become death, destroyer of worlds" as a huge dead centipede type creature is smoldering, and finally, a roar is heard, and the camera cuts to Godzilla, true to his Japanese origins, roaring. This same trailer was leaked a year later. On September 13, the movie's release date was announced to be May 16, 2014. In October, Legendary announced that writer Drew Pearce would polish the final script, making the principal characters older to suit the actors that Legendary intended to cast. On October 3, the movie was set to enter production in March 2013 in Vancouver. In addition, Drew Pearce, the screenwriter of Iron Man 3, was hired to do some rewrites to the script. On December 18, a screenshot of what appeared to be the Godzilla trailer was posted on the Tumblr of Jordane Menard, the modeler concept and texture artist for the film. Menard has said "I'm Working on the Trailer of the next Godzilla here at MPC London as Modeler and Texture Artist. I've worked on the foreground on the building and the characters." Also, Drew Pearce was asked, on his Twitter, if there's going to be some scenes where Godzilla breathes fire, destroys buildings, taking out the military, done right and will be nothing like the 1998 film and his response was "There's a lot of it in the current trailer... but new stuff coming very soon..."
In January 2013, it was reported that Warner Brothers, in a meeting for advertisers, revealed that the film would contain two new monsters in addition to Godzilla, and the plot of the film would revolve around the story of a young U.S. Marine. David Goyer, who is also a screenwriter, stated that there were two other monsters in the script when he worked on it. Frank Darabont, the writer and director of The Shawshank Redemption and The Walking Dead, was officially added to work on the film script. Darabont described his plans for Godzilla as returning it to a "terrifying force of nature" in interviews. The film will add a "very compelling human drama" and that Godzilla would be tied to a "different contemporary issue" rather than the original atomic bomb testing. Director Gareth Edwards, at a promotional appearance in 2012, described the tone of the film. On March 12, in an interview with Collider.com, Gareth Edwards said that the U.S. government knew about Godzilla for some time, and that the nuclear tests that they did were actually attempts to kill him. On the following day, it was announced the film had started production and filming on Vancouver Island. Also, Jim Rygiel, visual effects supervisor of The Lord of the Rings: The Fellowship of the Ring, has been hired to do the special effects for this film. On March 18, Warner Bros. Pictures and Legendary Pictures announced the final principal cast for the film, Aaron Taylor-Johnson, Ken Watanabe, Elizabeth Olsen, Juliette Binoche, David Strathairn and Bryan Cranston. Also, the film will be distributed worldwide by Warner Brothers while Toho will be distributing it in Japan, and the film will be in 3D. The day after, Gareth Edwards announced that they've finished filming the first scene. Also, reports of a burning helicopter and a nuclear missile being transported by a train have been cited at Nanaimo, Vancouver Island, all of this is rumored to be in the movie. On March 21, Richard T. Jones joins the cast of the movie. On March 28, Akira Takarada, who starred in previous Godzilla films, joins the cast of the movie. On April 5, Sally Hawkins joins the cast of the movie. On April 17, Brian Markinson joins the cast of the movie. On April 20, Yuki Morita joins the cast of the movie. On April 23, it has been revealed that Godzilla will continue filming for two months in Hawaii. On April 25, Legendary posted a picture in their wall showing a path of destruction Godzilla has left behind. On May 2, Legendary posted a picture in their wall showing what seems to be a power plant. On May 16, a new photo about people being hospitalized in the FEMA stadium popped up and was confirmed by Gareth Edwards appearing in it in an update. On May 18, Legendary posted a new picture in their Twitter. Other sources, like Lainey Gossip, PUNKD Images, Spoilertv, Clayton Perry Photography, and VancityFilming have put up additional pictures and videos. On May 22, Legendary uploaded a new photo to their Facebook page. It shows top secret documents that do not reveal much, but it also revealed a map of Maintop and Maintop Bay (Farallon Islands), which used to have nuclear waste dumped into them in real life. On May 24, Legendary was filming a scene with what seems like a ship set. On June 6, Legendary uploaded a new photo to their Facebook page. On June 10, many pictures appeared on Comicbookmovie.com surrounding the filming of the film. On June 6, many pictures featuring Aaron Taylor-Johnson and Bryan Cranston were uploaded in m.justjared.com. On June 17, Variety.com released an article that says that 'Godzilla' will have action figures, with Bandai America Incorporated as the film's master toy partner. On June 18, Comingsoon.net released pictures of posters from Licensing Expo 2013, including Jurassic Park 4, Ninja Turtles, and Godzilla. On June 19, Legendary posted a new photo on their Facebook showing a closed radioactive containment door. What's behind the radioactive containment door? On June 22, yvrshoots.com released pictures of Elizabeth Olsen on set. On July 15, IGN.com released a teaser poster for the Legendary Godzilla. On July 17, Deadline.com spotted and released an image of Godzilla from the Godzilla Encounter at SDCC 2013. On July 17, Collider.com posted around 75 pictures of what was inside Legendary's Godzilla Encounter museum. Between the many pictures, two concept designs of the Legendary Godzilla can be seen. On the same day, the Official Legendary Godzilla Facebook page released the third official poster for the film which reveals Godzilla's tail. The photo of the Godzilla statue below is close to the final design. The last day of filming was July 18, 2013. Godzilla will be a force of nature, not an antagonist or a hero, but an anti-hero. "He's the punishment we deserve". The theme is man versus nature, and Godzilla "is definitely on the nature side". There's a nuclear element in the movie, and the film will be "as realistic as possible". Toho was very involved in designing Godzilla. Edwards said "they feel we've stayed true to their roots. In the encyclopedias and books you read about Godzilla, there's these different groups - all of the Godzillas in one section and then there's the American film. I'd love ours to be considered as part of the Toho group." “ Starts off by showing a beach with atomic testing and mushroom cloud with ash falling from the sky with the Godzilla movie logo then shown. Now the footage that was shown at least year's Comic-Con is revealed, described as a "mood piece" (i.e. get the crowd excited). The footage of the destroyed city is shown with Oppenheimer's famous quote, "We knew the world would not be the same. Some people cried. Most people were silent." Gareth Edwards then steps on to the stage followed by Elizabeth Olsen, Aaron Taylor-Johnson and Bryan Cranston. Elizabeth Olsen says she plays a mother and a nurse in Godzilla. Cranston is next kidding that he is the old guy in the film, but loved the movie monster as a kid. Says he was nervous at first about being part of such an iconic character and film. Edwards then mentions that the human characters in the film are close to Godzilla, and then tells a funny story about getting stopped at the Canadian Border with Customs telling him not to F' up the movie when they realized who he was. Soldiers are shown running through streets and a flooded city. Cranston's character takes off his radiation suit; Olsen is shown crying. The military is then show with paratroopers and soldiers loading missiles. The shot continues, revealing a massive, skinny, four-legged monster. It seemed to have smaller arms on its chest and looked as if it had wings as well. The next shot is from inside the airport terminal and through the glass walls, we see a plane crashing in a ball of fire right in front of the structure as the monster approaches in the background. Godzilla’s foot lands in view as well. On July 20, sometime from 10:45 to 1:15 at Comic-Con, Legendary and Warner Bros. showed a preview for the film. On July 22, a video was uploaded to YouTube containing Godzilla's design straight from the Godzilla Encounter. It has since been taken down. On July 25, in an interview posted on io9.com, Gareth explains some of the symbolism behind the movie. On September 10, an image taken by a Brazilian Godzilla fan revealing the American Godzilla's final design was uploaded to Facebook. Elizabeth Olsen described the film as "definitely not lighthearted. It's kind of going back to its roots of the original Japanese film" and that "there's a strong theme of the importance of family, as well as the theme of trying to control nature, and how that backfires in the end". Cranston said that he plays a scientist called Joseph Brody that "discovers an anomaly in some sonar, signalings, patterns, and is just starting an investigation when all hell breaks loose". On October 4, the first teaser trailer for Godzilla was leaked. It appeared to be the first Comic-Con trailer. Four days later, a second trailer for Godzilla was leaked. On November 12, Moviepilot.com posted an interview with Gareth Edwards, Aaron Taylor-Johnson, Elizabeth Olsen, and Bryan Cranston. On November 21, a full body image of the American Godzilla was leaked on an Amazon.ca page for the paperback Godzilla: With Light and Sounds!. On December 8, the film's viral marketing campaign finally started with the M.U.T.O. Research website being launched. On December 9, USAToday posted a few pictures from the trailer and two other pictures from the movie. On the same day, TotalFilm posted a picture which is part of the viral marketing campaign showing Turkmenistan's infamous burning "Door to Hell", which might have something to do with M.U.T.O.. Visitors to the 2010 San Diego Comic-Con received a t-shirt with an image of the new Godzilla design. The image is credited to comics and manga publisher UDON Entertainment. Gonzalo Ordóñez Arias worked with Legendary and Toho for the painting. Visitors to the Legendary Pictures booth at the convention could view an animation of the new Godzilla breathing his atomic breath superimposed over their image captured via a webcam. The augmented reality promotion was designed by Talking Dog Studios of Saskatchewan, Canada. In the summer, Legendary opened the Godzilla Encounter, a museum where Godzilla props and merchandise can be seen, in summer. They also released a Godzilla Encounter application for iOS, and opened a Godzilla Encounter website. On December 8, the film's viral marketing campaign started with the release of the M.U.T.O. Research website. On December 10, Legendary finally released the official teaser trailer as well as a new poster and a new official site. On December 11, the Japanese version of the Godzilla trailer was released and the Japanese Godzilla movie site was launched. The trailer was mostly the same, although it contains two brief new shots. TV spots have also started appearing in Japan. It has since been removed. Toho made a couple of promotional images for the film in Japan. On January 15, ET Canada took a look behind the scenes of the film with Bryan Cranston. In January 2014's issue of Total Film, a few details of the film were revealed, such as Godzilla's height, the film's budget, and what fighting style Godzilla's was inspired by. On February 25, Legendary released the main trailer for the film. On February 27, Snickers made a commercial to promote the film. On March 17, Godzilla: Smash3 was revealed and the Godzilla toy embargo was lifted. On March 18, Warner Bros. released the international trailer for the film. This trailer was mostly the same as the main trailer, but contained several new scenes and dialogue. On April 1st, 2nd, 3rd, 4th, 5th, 18th, and May 7th, 17th, and 19th, Legendary Pictures released nine TV spots for the film, each titled, in order: It Can't Be Stopped, I Can't Believe This Is Happening, Whatever It Takes, Courage, Extended Look, Nature Has An Order, You're Hiding Something, Calling, and Awaken. On April 20, footage of Godzilla was shown at WonderCon Anaheim. On April 21, advance tickets for Godzilla began selling. On April 28, Legendary released the Asian trailer for the film. On May 3, a FIAT® commercial was made to promote the film. On May 16, Godzilla was released to American theaters. Most of its marketing from dates near the release was based on showing the film's good reviews. For a limited time, Godzilla cup tops were available in late May in Japan. In early June, Toho put up a Godzilla display in the JR Hakata Station in Fukuoka, Japan. They also had a Godzilla mural created on one of the walls of Toho Studios. In Japan, Toho made a pure gold, 24 centimeter, 15 kilogram statue of Godzilla 1989 valued at 150,000,000 yen and released pictures of it on July 14, 2014. In Japan, a 6.6 meter Godzilla statue based on the Godzilla design is to be unveiled in a park in Tokyo. Legendary released one official picture on Facebook on the 16th of July. On July 21, the statue was unveiled officially. In mid-July 2014, the Godzilla-movie.jp site was completely redesigned and updated. On July 16, Toho released a fourth TV spot for Godzilla, and is the only TV spot that shows Godzilla using his atomic breath. On July 21, 2014, Toho staged a talk event with 100 young women who weren't interested in seeing Godzilla at the Tokyo Midtown shopping and entertainment complex. Godzilla actor Shiro Sano, Godzilla voice actress Haru, and film commentator LiLiCo were there, and by the end of the event got many of the girls interested. They all then took a picture with the Godzilla statue. On August 18, 2014, Toho uploaded two more TV spots to their YouTube channel. Both spots featured the MUTOs more so than any previous trailer or TV spot. $61.8 million were spent to advertise Godzilla through 5,115 airings of TV ads in the United States. Godzilla made its pay cable debut on January 16, 2015 through Cinemax. Godzilla: The IMAX Experience is an IMAX release of Legendary Pictures' American Godzilla film. It was released in theaters the same day as the film, on May 16, 2014. "The IMAX release of Godzilla will be digitally re-mastered into the image and sound quality of The IMAX Experience® with proprietary IMAX DMR® (Digital Re-mastering) technology. The crystal-clear images coupled with IMAX's customized theatre geometry and powerful digital audio create a unique environment that will make audiences feel as if they are in the movie." Godzilla has received generally positive reviews by critics and fans alike. Rotten Tomatoes gave the film a 74% out of 100%. Mose Persico of CTV says it's "a film not to be missed," Scott Carty of ABC TV deems it "epic for all the right reasons," Shawn Edwards of FOX TV calls it "the most incredible movie of the year," and Nancy Jay of Daybreak USA says it's "an instant classic." IGN gave it 9.0 out of 10. The movie has also received its fair share of criticism, however. Most of the complaints revolve around the fact that Godzilla gets very little screen time, less screen time than the M.U.T.O.s in fact, and that the battles don't take up much of the movie's running time. In addition, some critics found Ford Brody to be bland and generic, and criticized marketing for misleading people to believe that Joe Brody was going to be the main character, though Bryan Cranston's performance has received universal praise. On opening day in Japan, the film received 3.55 out of 5 stars on Yahoo! Eiga. Shinji Higuchi, director of the then-upcoming 2016 Japanese Godzilla film, later praised the film as a "masterpiece" in an interview with the Associated Press in July 2015. The first award Godzilla received, or rather Legendary Pictures received for Godzilla, was the 'Japan Cool Content Contribution' award, or J3C, on September 13 at the Consulate General's residence. The award was crated to recognize creatives who popularize Japanese media for worldwide audiences, which the box-office successful Godzilla did. Alex Garcia attended and accepted the award on Legendary's behalf. Godzilla was also nominated for 'Best Science Fiction Film Release,' 'Best Film Music,' and Sony's Blu-ray Toho Godzilla Collection for 'Best DVD/BD Collection Release' as part of the 41st annual Saturn Awards. A graphic novel titled, Godzilla: Awakening, acts as the prequel to the film told from the point of view of Serizawa's father, depicting the creation of Monarch, its discovery of Godzilla, and their attempt to kill him at Bikini Atoll. It was written by Max Borenstein, the film's screenwriter, and Greg Borenstein, and illustrated by Eric Battle, Yvel Guichet, Alan Quah, and Lee Loughridge. Main articles: Godzilla: King of the Monsters and Godzilla vs. Kong. On May 18, 2014, after its successful opening weekend, a sequel was officially given the green light from Warner Bros. and Legendary Pictures. Edwards was confirmed to be directing the sequel, but it is unknown if any of the previous cast will be returning. In a previous interview with Gareth Edwards, he said that if the film were to have a sequel that he would like to do a Destroy All Monsters-like film. 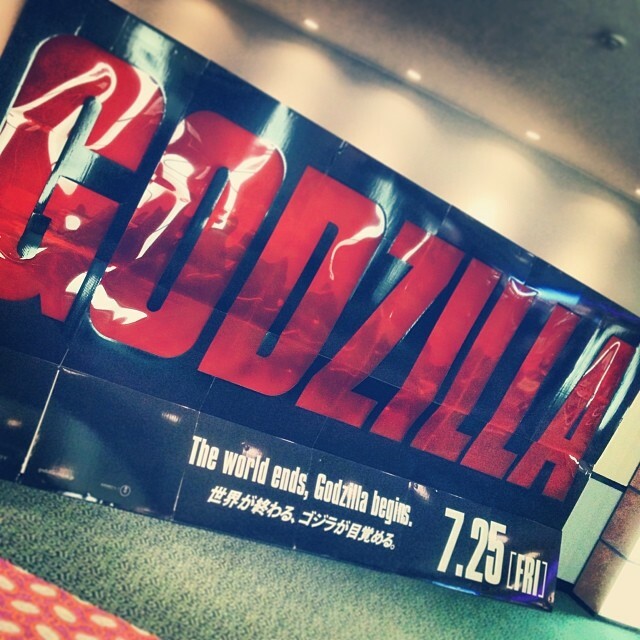 A piece of "Classified Monarch Footage," a teaser for Godzilla 2, was shown in Comic-Con 2014. According to eye-witnesses, it looked like it was put together in the 1960s, with audio of John F. Kennedy talking about threats and dangers. Text comes on the screen saying that there was one more secret: "There were others." A pterodactyl-like shadow and "CODENAME: RODAN." An extreme close-up of a giant moth creature and "CODENAME: MOTHRA." Then a silhouette and quick cuts around a dragon-like shape figure and "CODENAME: GHIDORAH." Finally, "THREAT ASSESSMENT: CONFLICT INEVITABLE," followed by "LET THEM FIGHT." On October 14, 2015, Legendary Pictures confirmed the production of a remake of King Kong vs. Godzilla titled Godzilla vs. Kong for a 2020 release. Legendary revealed its plans to create a shared cinematic universe featuring Godzilla and King Kong, with the upcoming film Kong: Skull Island serving as the next entry. Kong: Skull Island will be released in 2017, followed by Godzilla 2 in 2019, and finally Godzilla vs. Kong in 2020. Gareth Edwards has since dropped out of Godzilla 2 to work on other projects, and Legendary is currently in search of a new director. When Ford and Joe are searching through the ruins of the quarantine zone, the word "Mothra" can been seen printed below a glass case. At 355 ft. tall, or 108 meters, the Godzilla in this film was originally the largest seen in the film series. On March 31, 2015, it was confirmed that the Godzilla in Toho's Shin Godzilla would exceed the size of Legendary's Godzilla, coming in at 118.5 meters. However, the Shin Godzilla incarnation was then knocked down a notch by Godzilla Earth, introduced in the Godzilla anime trilogy, who was confirmed to be the tallest ever seen in the films at roughly 318 meters in height. This is the first film since Terror of Mechagodzilla where Godzilla does not intentionally cause destruction. A possible reason for this is that the director of the film, Gareth Edwards, was more familiar with the more lighthearted and heroic incarnations of the character, specifically the one from the animated series, when he was a boy growing up in Warwickshire in the center of England. Did you like Legendary Pictures' Godzilla? This poll was created on May 16, 2014, and so far 1491 people voted.